lately i've been really feeling Canadian le smoking with my favorite denim madewell shirt // vintage belt // current/elliott jeans // a chunky statement necklace and trusty Marant boots. your thoughts re: denim on denim? and what have been your go-tos this month? This is absolutely, positively, utterly unfair. Firstly that you can pull of denim on denim the way Jackie O would if she were alive today and going to shake hands with Texans, or out shopping for yet another scarf. And secondly, that I wouldn't have the foggiest idea how to wear those Marant boots. So kudos to you. ha! very sweet of you. the Marant boots are the easiest thing to wear in my closet. have you tried wearing with cuffed jeans? i wear them into spring and summer with shorts and dresses too. Ah, love denim on denim forever and always! I've yet to find the perfect denim shirt, but the way I wear it a lot of the time is a dark wash denim shift dress + a lightweight, light wash denim jacket. Also, "Canadian Le Smoking?" genius phrase. 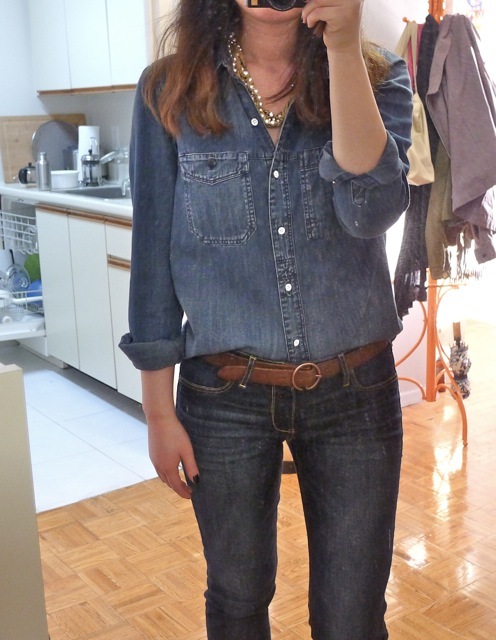 Denim shirts really aren't my thing, but you look great :) I like the proportions and the tan belt is a nice touch. You look wonderful - love dark blue with a touch of brown anyway and your necklace is a perfect touch. I would love to try it but I don't have a denim shirt so I may use a chambray one instead but for me I think I would have to add even more girly touches such as pointy kitten heels and a little vintage bag. thanks! i think adding some feminine accessories totally makes this work. I think that necklace makes your look. Nice. thanks! i think it's easier to wear than you think with contrasting shades of denim. be fearless and try it! I'm not much of a fan of denim shirts or denim on denim, but you wear this so well. You look lovely and the necklace adds a touch of elegance to the look. So few can pull this off. thanks Lindsay! something about this season and denim...i think jenna lyons did it so well a few years ago on The Sartorialist. I'm curious to hear what other shoes you style your denim on denim looks with. i like to wear my Marant boots but it's warming up now, so i might do a little update soon!